The Taylor Creek Visitor Center is the hub of four fascinating self-guided interpretive trails and the Stream Profile Chamber, a primary attraction at the complex. 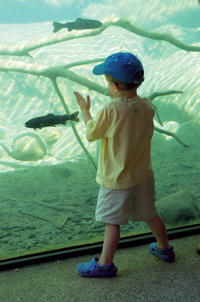 This unique underground viewing chamber, located along the Rainbow Trail, provides a view of the stream environment allowing visitors to study a diverted section of Taylor Creek through a panel of aquarium-like windows, offering a fish-eye view of Taylor Creek’s underwater wildlife. One may spot brightly colored fish, diving ducks, crayfish or other hidden surprises in the chamber’s mural that follows Taylor Creek through the four seasons. This upfront wildlife experience is appropriate for all ages. The Rainbow Trail, Lake of the Sky Trail, Forest Tree Trail and Smokey’s Trail meander through several habitats, from stream to marsh to forest to high desert. Interpretive signs along the trails provide a fascinating look at plant and animal life, geology and ecology, as well as natural and cultural history of the area. Another trail leads to the nearby Tallac Historic Site.